Two weeks before our trip to Sweden, this was one of the last practice rides. We brought all our camping gear, as well as food for several days. The destination was the Belgian Ardennes, a hilly region with lots of forests, where we planned to cycle route along the Ourthe river and following cycling route Ravel 5. This was the first time we brought our recently purchased cooking equipment. Even though we were well-prepared, the bumpy paths and steep hills of the Belgian Ardennes proved to be quite challenging for us spoiled cyclists used to the smooth cycling paths in the Netherlands. Originally we had planned to leave on Friday, but due to a change in scheduling, my girlfriend was able to get off work early on Thursday, so we decided to leave Thursday morning instead. At the train station we had more than ten minutes to spare, and were the first bicycles in the train. 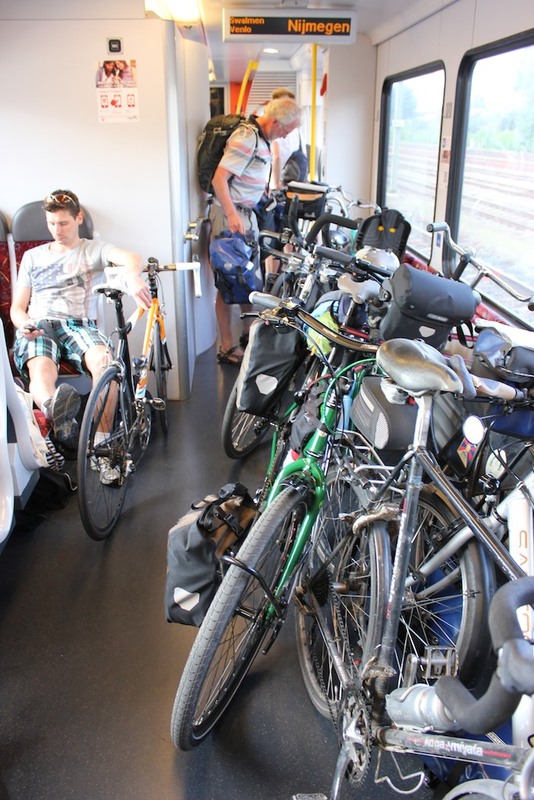 Over the next several stops, many more bicycles entered the train, which quickly filled up the bicycle storage space. We had to change trains once, with only two minutes to rush across the platform. There were many other bicycles in the train already, so instead, we just went into another compartment that wasn't meant for bicycles. Because it was pretty cramped, and one of the bicycles was blocking one of the doors on the left side, we would move the bicycle away when the train stopped with the platform om that side. Just as Mimi went to the toilet, an old woman came to ask whose bicycles they were, to make sure that they would be out of the way. As I was keeping the bicycle out of the way, a man entered and sat down on the seat where I has been sitting. I tried to get his attention, but he was conveniently wearing earphones. Eventually some other passengers intervened and told him that the spot was already taken. 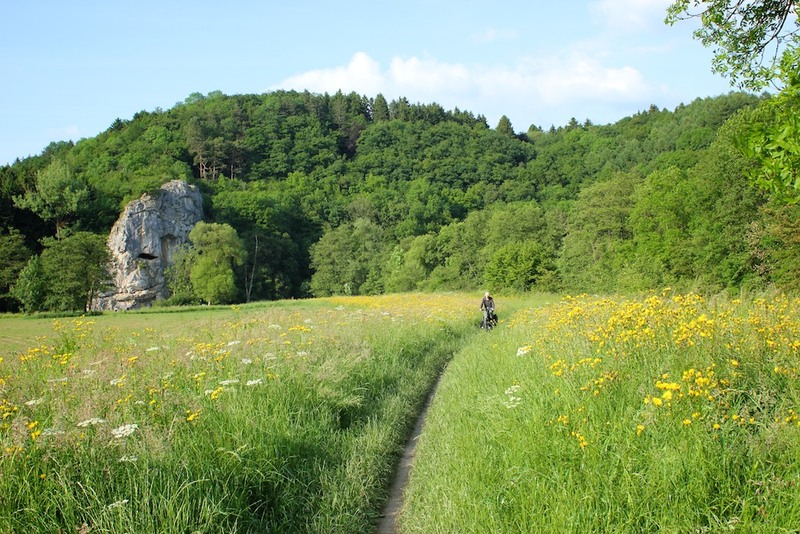 Our cycling route from Maastricht to Vielsalm. Video of 5:54 minutes long, taken during the trip, available in HD. The video while riding is taken with a GoPro Hero camera, mounted on the handlebar. 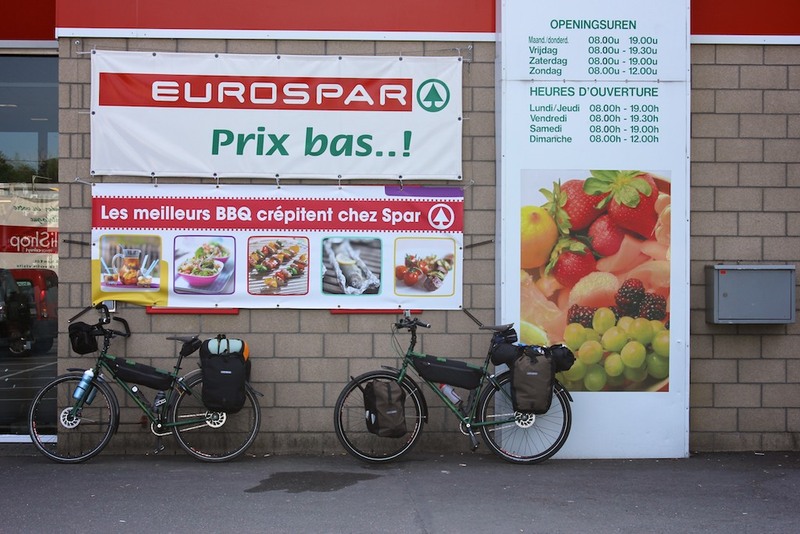 Once in Maastricht, we got on our bicycles and headed south for the Belgian border. Soon after we entered the country, we were misdirected into a dead end by a sign that clearly stated that it was a cycling path. I took the opportunity to change into my padded cycling shorts. 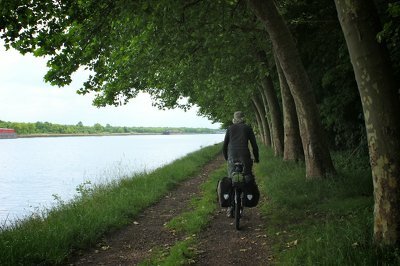 We cycled south along the river Maas towards Liege. Soon we stumbled upon a round sign with a red circle around white center. This means forbidden entry for all vehicles, so we went across the bridge instead. The map showed that there was a path there too. We followed the path, which was quite nice, but eventually it ended up in some farmers' field. 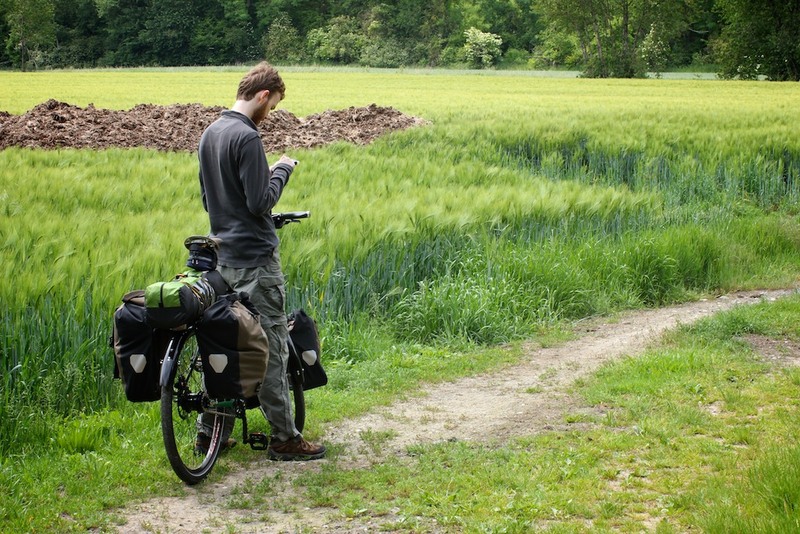 The map still showed a path, but not feeling like dragging our bicycles through a field of wheat, we backtracked. We continued along the river on the left side, disregarding the signs, just like many other people were doing. It turned out the "forbidden" path was the correct one. Time wasted: one hour. A nice cycling path along the river, but it leads nowhere. Trying to find the way in a field of wheat. After getting back on track again, Mimi's bicycle started making some strange sounds in the rear. At first I thought it might be the internal gear hub (Shimano Alfine Inter 11 ) that I serviced before the trip, but it turned out that the disc brake rotor had come loose. The cause was probably heavy braking during our little detour on rough terrain. The lock ring was labeled for a torque of 40 Nm (very tight), and I assume they did not do that in the factory. I was able to screw it back on with my fingers, which thankfully held up for the rest of the trip. Not long after that we came along the town of Herstal, famous for being the home Fabrique Nationale, the gun manufacturer. The town itself was industrial and depressing-looking, so we did not stop to explore it any further. It was late in the afternoon when we arrived in Liege, around dinner time. We went into the city because Mimi had to go to the train station to buy train tickets to use later in the season. The city looked run-down and dirty. Without much else to do, we continued south. Although we were following a cycling route, we were led onto a busy road with cars, at what seemed to be rush hour. We crossed the river several times; at one point we had to loop around to get back onto the path, only to find there that there was a cycling bridge, which we did not see at all. If I had been alone, I would have blamed it on myself, but for two people not to spot it, I blame the bad signage. We continued along the river for a while until we came across a campsite around eight in the evening. The office at the entrance was abandoned. We rang the bell, as the sign told us to do in French. Eventually a guest who was staying in one of the cabins arrived by car and told us to set up the tent at a certain spot and pay in the morning. The facilities at the campsite were decent for Belgian standards. The wash rooms were filled with dead bugs and had not been cleaned in many weeks, and there was only cold water. We were slightly confused by some of the faucets being marked as "non potable", while others had no marking. 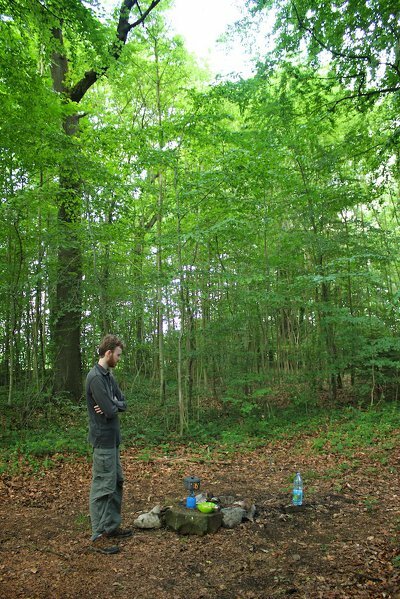 There were, however, visible particles in the water, so we decided not to drink from it. Dinner consisted of canned pea soup with bread that we had brought from home. This was the first time using the gas burner, which worked pretty well. I felt a bit cold at night in the tent, and all throughout the night there was the sound of a dog barking from somewhere else on the campsite. 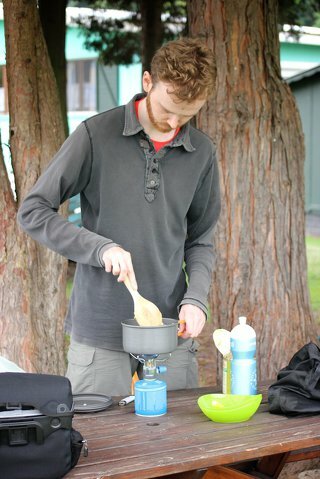 Trying out our new camping cooking equipment. In the morning we packed up our things, waited for the tent to dry, and wrapped it up. It was already past 10 in the morning, and there was still no one at the reception. We looked for a place to leave the money, but could not find a suitable place. Eventually we decided that the owners apparently didn't care a lot about being paid. Since all we got was a few liters of cold, non-potable water, and bad night's sleep, we did not really feel like putting much effort into it and left. We headed for the nearby town of Tilf. There was a steep ramp to climb up which ended rather abruptly at bridge where cars were driving. Very dangerous. In the town, we got some pastries from a baker as well as bananas, two liters of drinking water and some granola bars from the store (Lidl). We ate our breakfast outside of town and continued along the river. The surroundings were quite pleasing. We only had some bread for lunch, and by the time we got to Hamoir, we were a little hungry. We stopped at a place that had some food on the menu, however, the kitchen was apparently not open yet, so we just had some drinks. Following the right path often involves ignoring signs in Belgium. 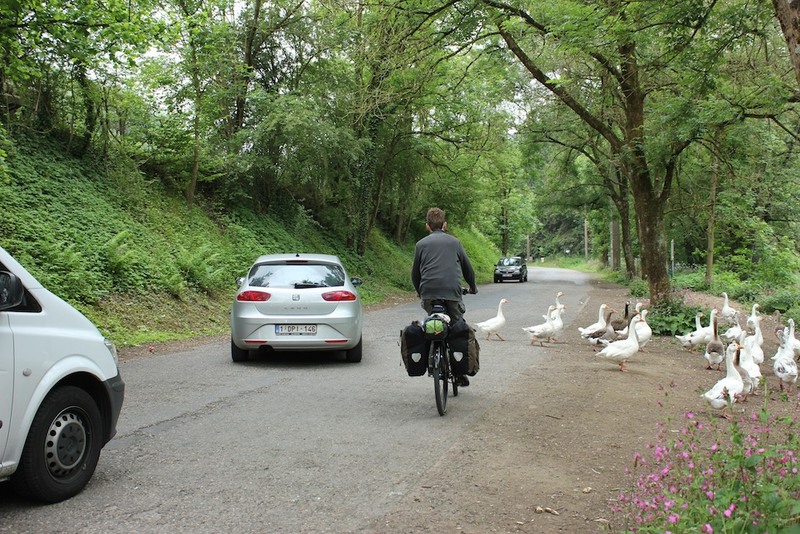 A flock of geese was blocking the road. The cycling path went straight through a camp site, the only one we came across that was not completely crammed. After Hamoir, the cycling path along the river seemed to end, so we had to go another way. The map showed a path to Sy, so we decided to follow that. We climbed a hill for several kilometers. The road started off pretty nicely, but gradually got worse. Eventually we reached the top; Mimi was quite exhausted and not very happy. She wanted to go back and go along the car road. I feared that going back would mean that we would have to climb back another hill. The path going directly to Sy was however looking very bad; hardly a walking trail. We warmed up some broth and ate it with bread to regain some energy and then decided to go down the path. Like many roads in Belgium, it got progressively worse, and eventually forced us to walk most of the way. The bicycles had to be lifted over fallen trees and down some steep slopes. In retrospect, it probably would have been better to go backtrack a few kilometers. Contemplating whether to continue over a bad trail, or back track. This scenic route is definitely not a cycling path. 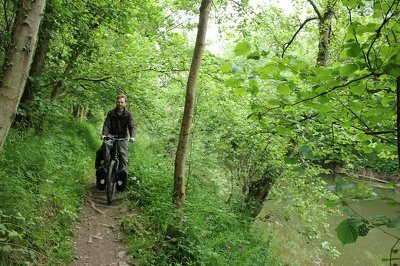 Eventually we reached the river and emerged from the forest, and a few minutes later cycled into Sy. 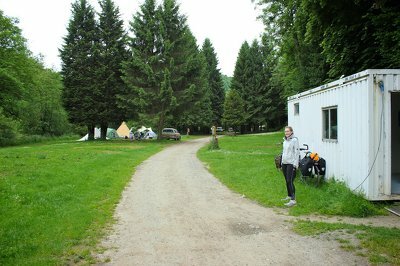 There was a nice looking campsite and hotel, which we contemplated staying for the night. Mimi was feeling better and wanted to continue to Durbuy. There was a path along the river that we decided the follow. The path started out as very nice, flat concrete, at least two meters wide. 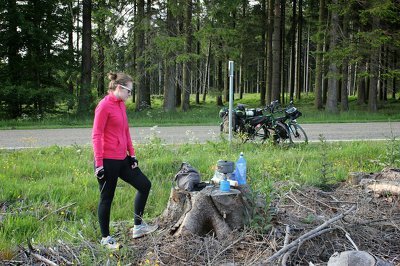 After several kilometers, it suddenly degraded into loose soil with tree roots and rocks sticking out. Eventually there were puddles of mud. After that it transformed into a single track through some fields. Narrow, but at least the path was ridable. Cycling through a field along the river between Sy and Bomal. 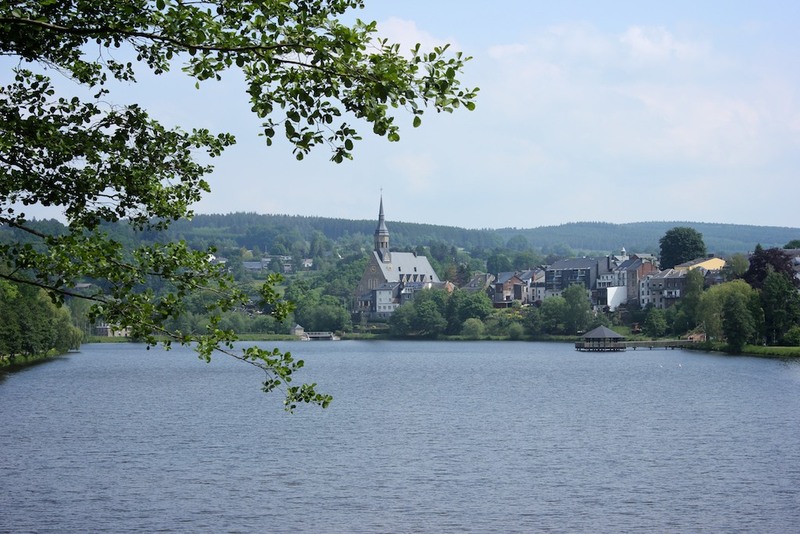 We cycled past the towns of Bomal and Barvaux. There were some campsites along the way, but they were all extremely crowded. 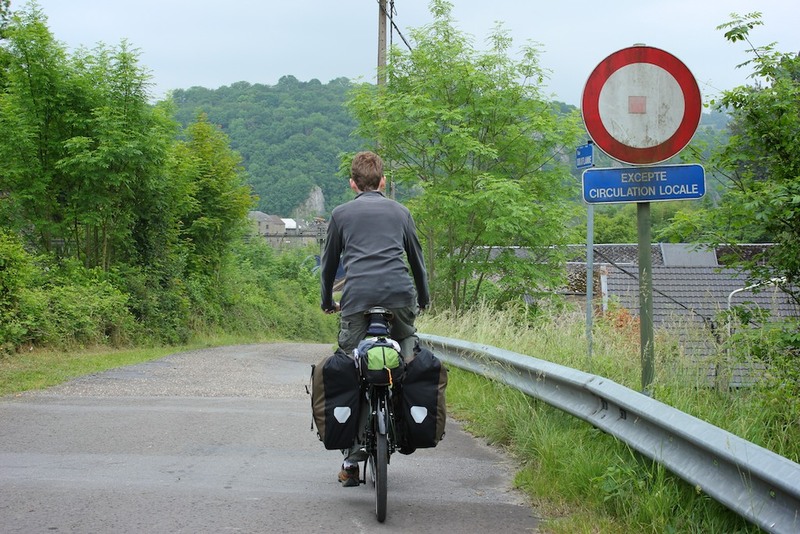 After all the bad cycling paths, we decided to take the more direct road for cars towards Durbuy. It was quite a climb, followed by a steep descent. 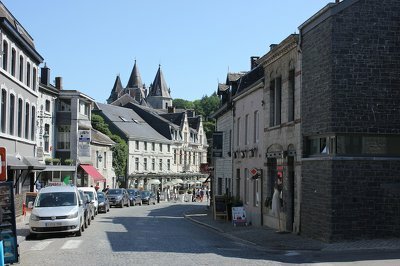 We wanted to spend the night in Durbuy, and after an exhausting day were ready to do that in a hotel. We entered town near a guest house which had a sign out saying that it had rooms available. After not finding anyone, I eventually found a woman who was serving food and she told me there were in fact no rooms available. The next two hotels also had signs saying rooms available, but nobody answered at the reception. Several other hotels had similar signs, but were full. We eventually gave up and decided to have dinner and go the campsite later. I chose the Belgian specialty of Pizza Frites. Time wasted inquiring at hotels: 45 minutes. It was past 10 in the evening and getting dark when we rolled onto the campsite just outside of town. The campsite was full, but the man at the reception directed us toward a small patch of grass with hard soil next to the parking lot for motor homes. The field for tents was cramped with noisy people playing music. There were warm showers included in the price, and the people in the motor homes stayed quiet at night. When the sun came up the tent was in the shade, so it took a while for it to dry up after a cold night. After packing everything up, we went back to Durbuy and got some breakfast from a local baker. Waking up on a small, hard patch of soil surrounded by motor homes. This parking lot for motor homes passes for a camp site. Leaving the town of Durbuy to head further south. 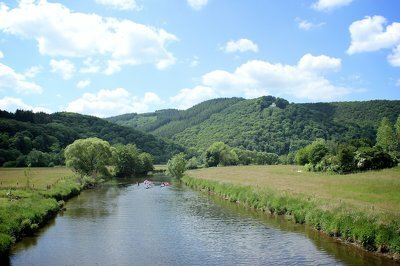 There was no path along the river, so we went up the car road to onto Hotton where we had lunch. On the road I had noticed that the rack the rear rack of Mimi's bicycle was swaying. It turned out that the bolts had unscrewed themselves a little from the strong vibrations of the bad roads in the days before. During our lunch break, I tightened the bolts. I decided I would add some Loctite when we got home in order to prevent this in the future. From Hotton we cycled to Rendeux, mostly on the road. We got some ice cream and strawberries that were being sold along the road. 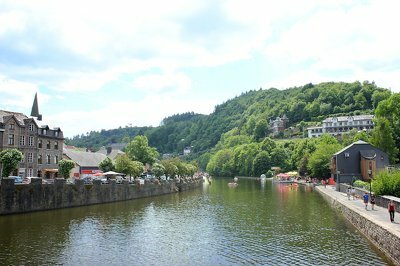 Eventually we took some cycling paths to La Roche-en-Ardenne, which were not the shortest route, but quite scenic, and of decent quality. The scenic cycling path to La Roche-en-Ardenne crosses over a river. 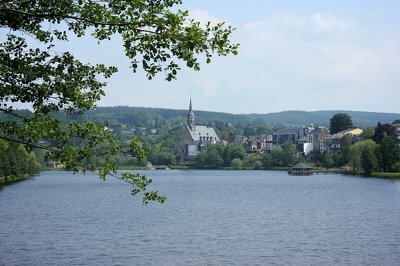 A view of the touristic town of La Roche-en-Ardenne. 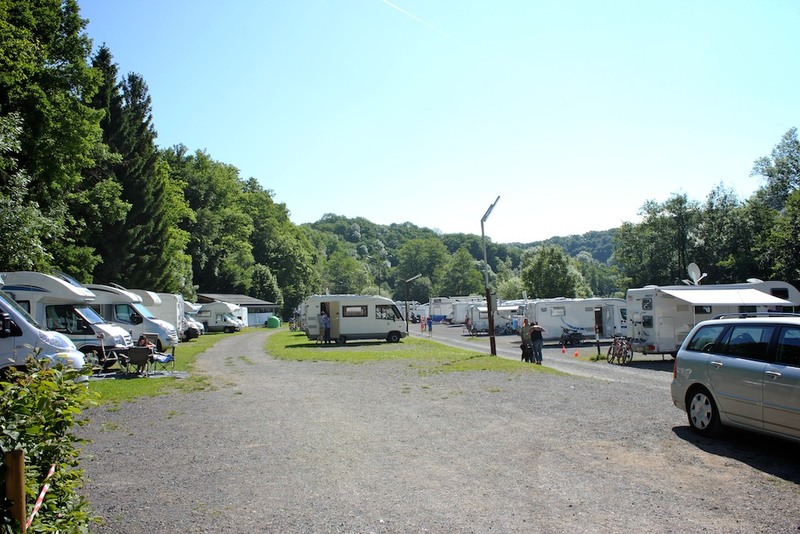 When approaching La Roche-en-Ardenne, we came across several campsites, all of them crowded. The town itself was crawling with (Dutch) tourists. We had a drink and bought some salty snacks at the local supermarket. By this we had almost ran out of cash, but could not find an ATM or bank. 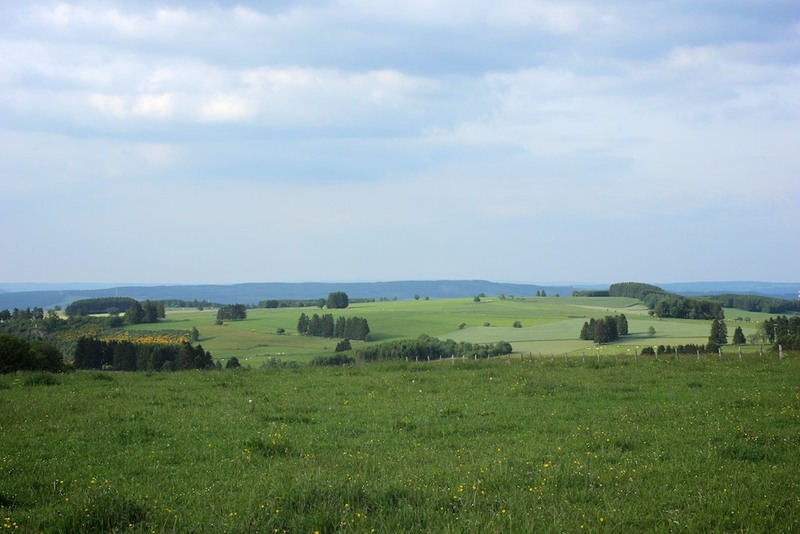 We decided to continue to Vielsalm, which was 30 kilometers away. We decided to take the route along the N89, which seemed to lead us straight there. What the map did not show us is that right outside of town was a very steep and long climb, with an incline of over 450 meters. For most of the time, we were in the lowest gear, crawling up the hill with frequent stops. 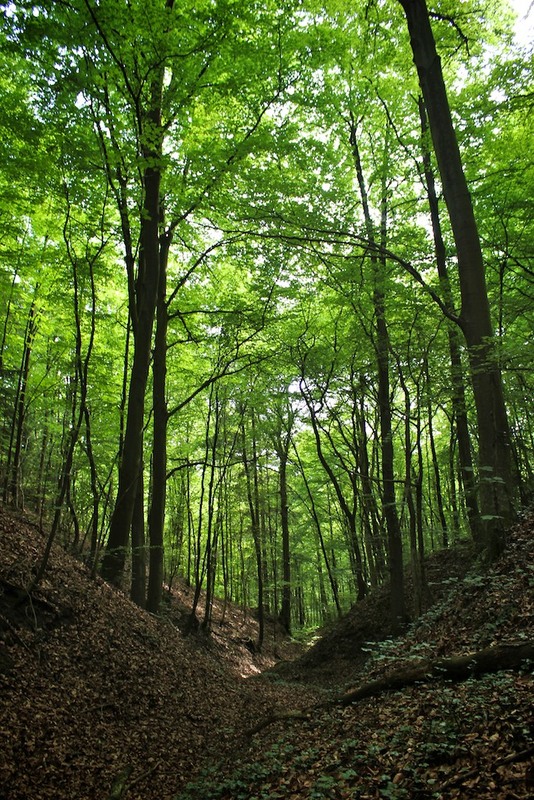 It seemed to take forever, and at the pace we were going, we would not reach Vielsalm before midnight. Mimi was getting exhausted, and after a while my knee was starting to hurt. What seemed like the top was actually just a less steep road, but at least we were able to pick up the pace. We took a break and boiled some broth, which we ate with bread we purchased in Hotton. The last 15 kilometers were mostly downhill, which took a fraction of the time it took going up the hill. 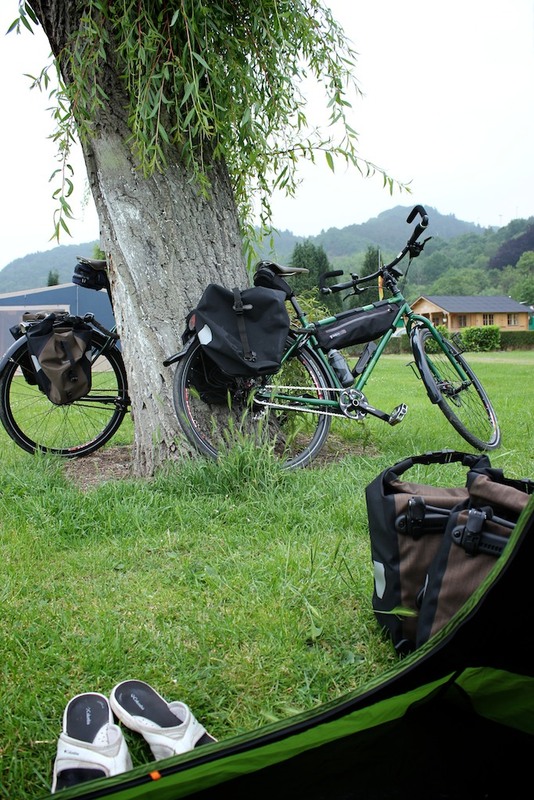 The road was good; even fully loaded, the bicycles were very stable. Most of the time we were able to be in the highest gear. Taking a break along the road after a long climb. 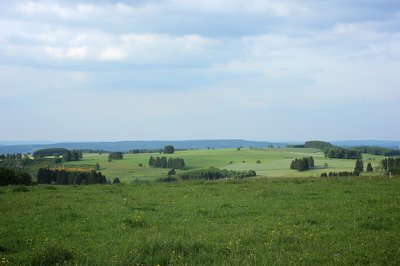 The view from the road to Vielsalm: rolling hills. 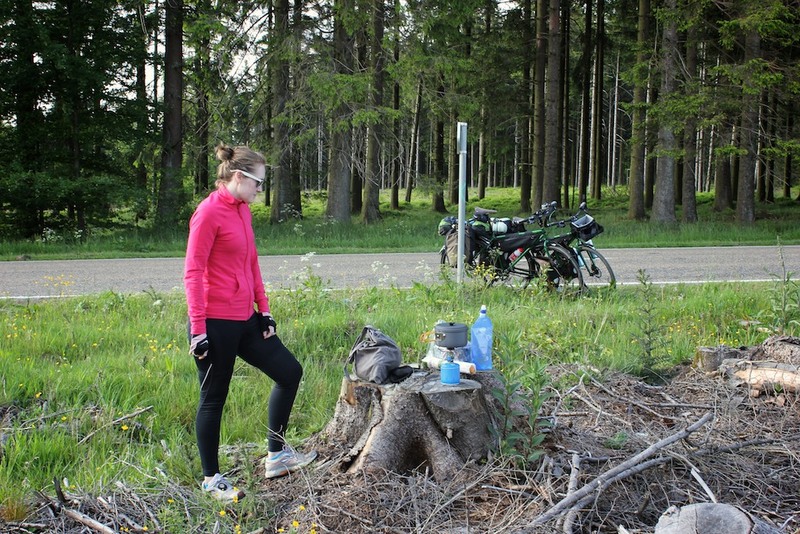 We rolled into Vielsalm, inquired about rooms at a hotel, but decided to camp instead. We were still low on cash, but there was an ATM in the city center where I got some money. We went to the campsite north of the town. The woman at the reception did not speak any language other than French, but I was able to get a camping spot relatively easy. Too bad the space for the tents was a small patch of grass next to the entrance. After setting up the tent, we left for town to get some dinner. Riding the bicycle without all the bags on there felt kind of unsettling; very twitchy and light, compared to being fully loaded for three days. We checked the menu at a restaurant, but it was not that appealing. I wanted to get some Belgian fries. We got a large portion with some ketchup and snacks to share. I did not think we would be able to finish dinner, but it proved easier than anticipated. 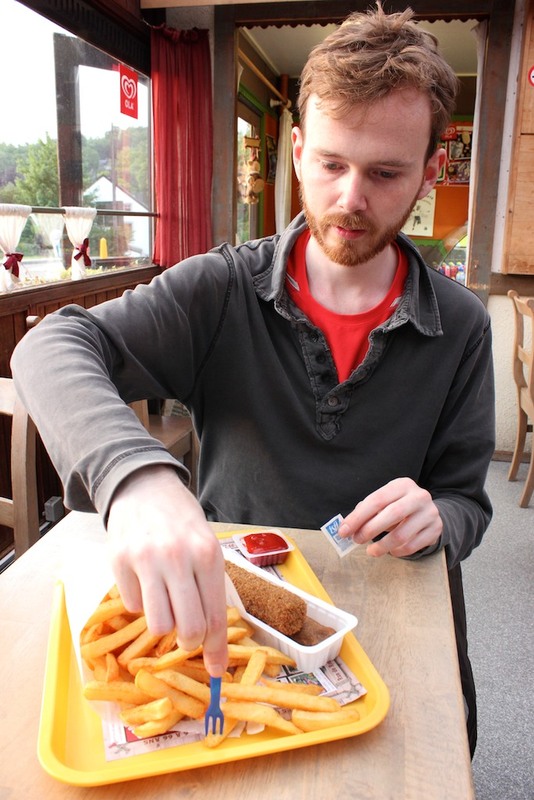 A short time later, a couple of Belgians entered the establishment; they each had a large portion of fries, without anything else. After dinner, we headed back to the restaurant for some dessert and drinks. I had some Speculoos Tiramisu, which was really good, while Mimi had a local Belgian beer. It was really warm inside the restaurant, despite it being a bit chilly outside. There was free wifi, which we used to plan the rest of our trip. There was no way to leave the town without climbing more big hills, and after considering all our options, we decided to get on the train and head towards home the next day, one day earlier than originally planned. At night there were sounds of French people talking, cars entering the campsite, a very noisy industrial machine doing some work nearby, and eventually the sound of our drunk neighbor snoring in a tent a few meters away. I used my earplugs in an attempt to block out the worst noise. The first order of business was to pack up everything and get breakfast. 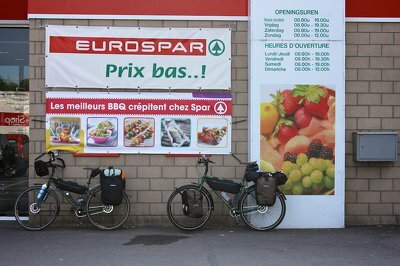 The supermarket next to the campsite happened to be one of the few shops open on a Sunday. We got some excellent pastries, yogurt and some fruit for breakfast. Getting breakfast at the supermarket in Vielsalm. Waiting for the train near the lake of Vielsalm. We could see the train passing on the nearby track, expecting to get onto the next one in one hour. We cycled to the train station and discovered that the next train wouldn't go for another two hours. Also, the ticket machine was broken, and the train station itself, including the toilet, was closed until the early afternoon, after our train would have left. Not very helpful. After relieving ourselves in the bushes behind the train station, we chilled in a nearby park for an hour or so. At the train station there was an announcement in French about some delay, but luckily our train arrived on time. You are permitted to take bicycles on Belgian trains, but there are no special places for it. We were far from the only cyclists going on the train. Several other bicycles were placed in the passageway; we left our bicycles in the compartments near the door. Although we were not able to buy a ticket, we boarded anyway. I have seen people buying tickets in the train in Belgium, so we planned to do that. The train went along the route that we passed a few days earlier, and eventually arrived in Liege. Nobody ever came to check or sell tickets, so we just got off and left. We cycled over the cobblestone streets of Liege and headed north along the river. We had the wind facing us, and since we had been there a few days prior and were more exhausted, it seemed to take much longer. In the afternoon, we rolled into Maastricht, where we headed directly towards the train station. In Belgium, some Dutch people told me that the trains were not going between a couple stations. The buses that replace them can not always take bicycles, and there is no way to tell beforehand. We decided to take an alternate route, which included two stopovers, but was not that much longer. Because it was such a good idea, we were not the only ones who had it. The train had two bicycle compartments, and since we were early, there was only one bicycle in there. After us, however, three more bicyclist arrived, most of them with fully-loaded touring bicycles. The next train was a small local train. The newer models have lots of bicycle space, but the one we were on did not. Nevertheless, eventually over ten bicycles were squeezed into it. On the next and last train, there was no problem. I was probably a bit dehydrated and drank a lot of water. We arrived home around 9 in the evening. Many bicycles cramped in the a local train. Since our bicycles being modified mountain bikes they were able to withstand the challenging terrain. We did have some issues with a disc brake rotor, and various bolts coming loose from the strong vibrations. I was able to re-tighten them to complete the trip. The gear range of the Shimano Alfine Inter 11 internal gear hub was just barely enough to climb some of the toughest hills with our fully loaded bicycles. The camping experience was pretty bad. Most campsites seem geared towards cabins and motor homes; tents are treated as second class customers. We came across only one campsite that seemed better suited for tents, but that was in the afternoon and we did not stay there. 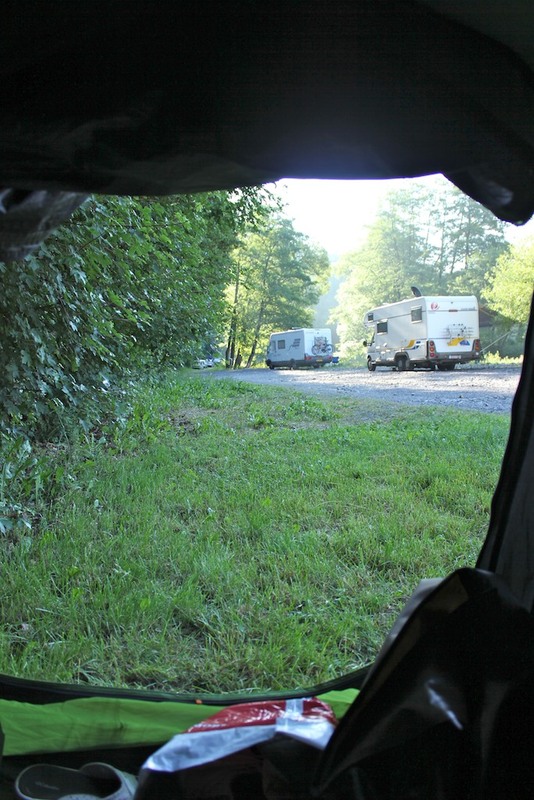 I honestly believe I would have had a more comfortable sleep somewhere in a field, a park, along the road; anywhere but a campsite would have been preferable, if only it were legal. Because we left a day early, I did not go through the SD-cards that I brought. Most of them had something on there already and I could not tell what, or how empty they were. This sometimes caused the camera to stop because the memory was full. One of the cards also had a problem with file corruption. Since I could not see the display, it would sometimes not record when I thought it was recording, and vice versa. The Belgian roads were so rough that I did not use the hand held extendable stick even once. I did not feel safe using it on the roads with cars passing by. With the camera mounted on the handlebar, I did not get that many interesting shots, but at least I was able to take some video. I wanted to make video with the camera mounted on my head, which allows for hands-free recording. I thought I hadn't pack it. Only after returning home did I find it in a pocket where I had stuffed it during an earlier trip. The GoPro lasted the whole trip on a single charge of the battery; only when riding into Maastricht did it run out. The key is not to leave the camera recording hours at a time, but just to turn it on when things get interesting, which is of course easier when it is mounted on the handlebar. Navigating around Belgium is quite challenging. 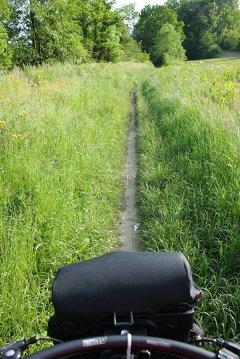 Sings are often missing or wrong; bicycle paths sometimes degrade into very poor trails. For this trip, we tried to rely on signage aided by some offline maps on my iPhone. This proved to be less than optimal. I have no idea if we actually followed Ravel 5, we sometimes would come across signs labelled "Ravel", but sometimes the paths were so bad that we must have deviated at some point. Many of the roads were such low quality that it would have been preferable to take a detour. Unfortunately, neither the signs or maps gave any indication of the quality, and incline of the roads. A good paper map would have been useful. An accurate, up to date, detailed map specifically for cyling would have been very useful, unfortunately as far as I am aware it does not exist. Without such a map the best strategy seems to be to stick to the car roads, but even there you might run into unexpected inclines. For this trip we brought a Waka Waka Power solar panel, battery pack and light in one. We also had two smartphones (used predominantly for navigation,) a DSLR camera, video camera and GoPro action camera. All devices were charged before we left. When using GPS with Google Maps, the iPhone lasts for about 50 kilometers. Because of data roaming charges for Belgium, we only used an offline map, which had the benefit of greatly reducing the power consumption. I was able to use it for two days. The Waka Waka Power can charge a smartphone pretty quickly, but charging it in the sun takes a whole day. I had it strapped on top of the pannier, where it was regularly in the shade. Even in the sun, the charging light would only do double blinks, indicating a medium charge, rather than a triple blink, which indicated a fast charge. We didn't really have access to any other power sources, so it was nice to have the Waka Waka, but it could only be used to charge one phone at the end of the day, with the remaining power being used for light. 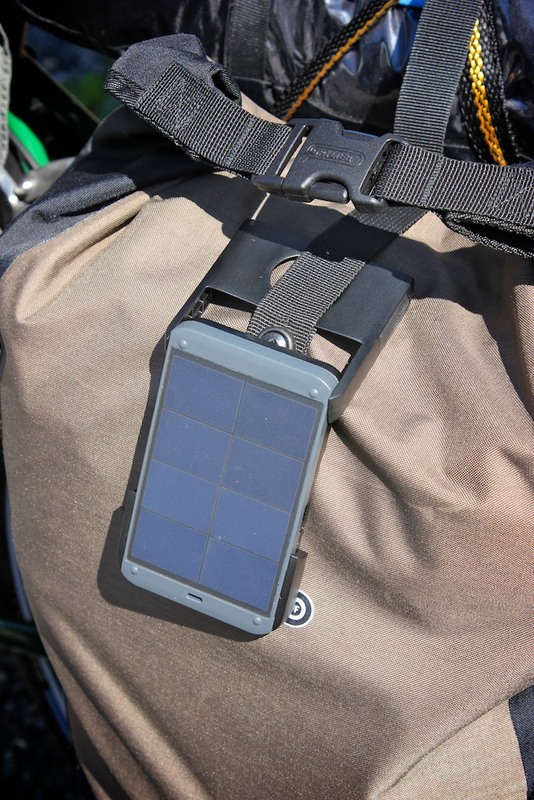 Waka Waka solar panel on rear pannier.